Where do I put my Coupon Code? Who doesn't love a good discount? From time to time we will run promotions and give our customers a coupon code discount. 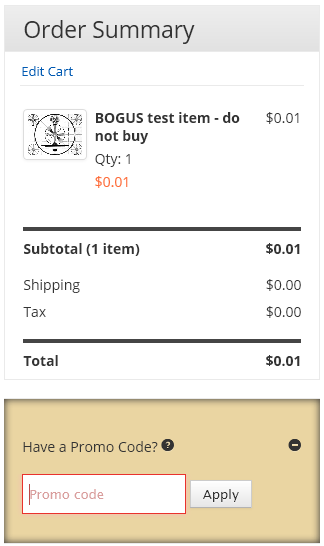 A coupon code is a magic phrase that you put in your checkout form to give you a specific amount off your purchase. During checkout, simply click on "Have a Promo Code? ", enter your coupon code, and click "Apply". Your discount will be immediately applied to your total and will be reflected on your invoice. For your convenience, you may order gift cards in almost any dollar amount online. Gift cards are mailed via US mail (unless otherwise specified) and usually take 3-5 days to arrive. If you need to rush deliver a gift card, you may do so by contacting us at 1-800-544-7625. Additional charges may apply. In addition, gift cards are available to purchase in all of our store locations in any amount. Gift cards do not expire. Did you know you can redeem gift cards online? It's really simple! Add the item(s) to your cart that you wish to purchase and proceed to checkout. 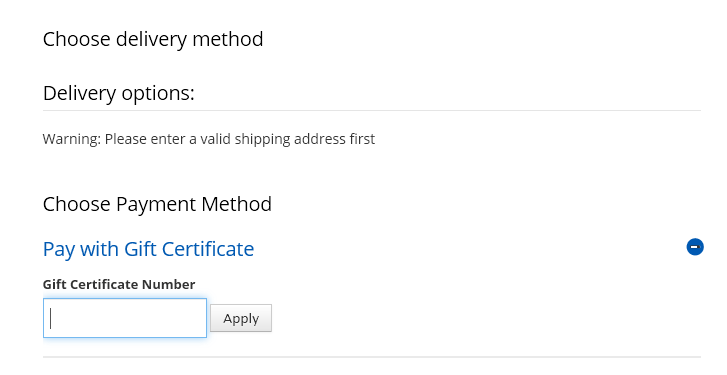 On the checkout page, below the delivery options, click on Pay with Gift Certificate. Simply enter the online code from your gift card or e-gift certificate into the box and click apply. If your gift card balance is not enough to cover your entire purchase, you will be asked for an additional payment option.